As Franklin just loves to constantly remind me, I am not an avid reader of science-fiction. This doesn’t mean I don’t like it, as some of my favorite stories draw from both sci-fi and fantasy like A Certain Magical Index, and the Artemis Fowl series. Even so, the times I do read straight sci-fi are quite rare. Perhaps since sci-fi is usually task-oriented, more about accomplishing a goal rather than discovering or exploring an unknown universe. Fantasy tends to focus on exploring a world with a certain sense of wonder as characters carry out their objectives. At the very least, this has been my experience. Even so, duty calls, and with a choice between Haibane Renmei and 7 Billion Needles, there was no way I was going to touch anything involving Yoshitoshi ABe. 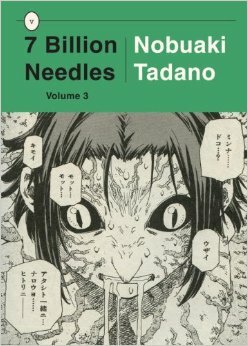 7 Billion Needles, was created by Nobuaki Tadano in 2008, as an adaptation to Hal Clement’s sci-fi novel Needle. Nobuaki Tadano also worked on a manga called Ethnicity Zero One. 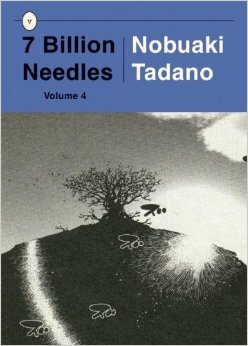 7 Billion Needles is the story of Hikaru Takabe, a loner high school girl whose headphones may remind you of Neku Sakuraba. 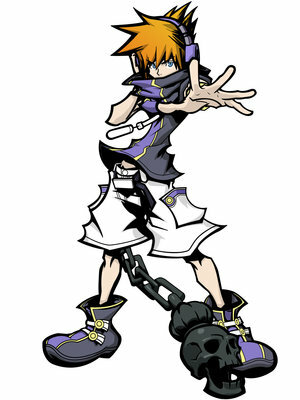 (You know, from the The World Ends With You, anyone?) In the middle of a school trip to the beach, while everyone is gathered together and having fun, Hikaru is, predictably, as far away from the merry-making as possible. This quickly backfires on her as she spots a meteorite heading right at her. Too astonished to even think of running, Hikaru is vaporized, flesh, bone, and all. However, she wakes up back at home, and, thinking it was all a dream, continues to go on with her life. That is, until she hears the voice of an alien called Horizon, who claims to have fused with her in order to repair her body after he destroyed it. The story is divided into two parts, the first involves Hikaru’s meeting with the incorporeal alien Horizon in his quest to stop a similarly bodiless being named Maelstrom, who seeks to eradicate all life on earth with a modus operandi that would be best described as half serial killer and half assimilation plot. The second part involves an evolutionary crisis resulting from the aftermath of dealing with Maelstrom; this one gets really heavy on the assimilation plot as well as some social Darwinism themes, though not in the way they usually play out. Tadano’s art style, while not exactly to my tastes (there is a reason Franklin won’t stop calling me the moe guy) is a perfect match for the manga. The characters are far from pretty; plain is the best way I could describe them. 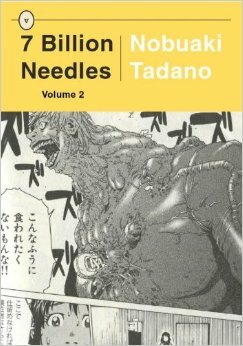 Monsters on the other hand…Tadano seems to have been born with the talent to draw growths of flesh where they should not grow. His monsters go all the way from dinosaur-like to Lovecraftian masses of flesh made up of several (often still struggling) living creatures fused together. It is no exaggeration to say the art is the keystone to all the horror in the manga. The characters overall aren’t terribly original or interesting. Hikaru is an obvious loner with some Freudian excuse, Horizon is overly serious, long-winded, and about as lawful good as you can get, but also naive considering he never questions his endless mission to deal with Maelstrom. Maelstrom, the villain for the first part of the manga, is an utterly psychotic, yet calculating villain, trying to figure out the meaning of his existence when he is not too busy killing everything in sight. Out of all the characters, he may have been the only one I actually looked forward to understanding. There is also a third alien, even more powerful than Maelstrom or Horizon; he takes a judge-like position when first introduced, but quickly reveals himself as a bit of a goofball as the second part progresses, but curiously, he never takes a name for himself. Hikaru eventually makes two friends, Nao and Saya, but they aren’t really developed beyond encouraging Hikaru and some light comic relief. If there is something I feel I should take issue with, it is probably the villain for the second part. While the series always makes a pretty big deal about the ability to love and forgive, it falls flat when the main motivation for our villain was that she accidentally got excluded from some karaoke meeting. She throws a temper tantrum with the new powers she accidentally gets (along with several other creatures) and tries to absorb every living thing in an effort to not feel alone. I would be lying if I said there was no pathos in the way it was handled, but I feel it would have been far more justified if the villain and hero positions were switched. Pros: Great monster art that seems to have come out of a Lovecraftian novel. Characters have relatable emotions. Often funny without breaking the mood. A very simple but fitting solution brings excellent closure. Cons: Very plain human artistry which is not as impressive in comparison to every other visual aspect. Has rather weak characters that don’t really stand out. Final villain is rather difficult to sympathize with. 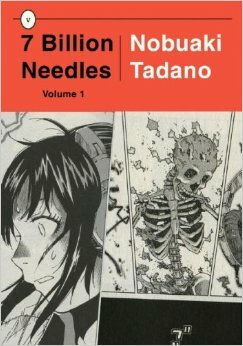 Ultimately 7 Billion Needles manages to cram in four short volumes all the awesome of science fiction and body horror while still managing to make room for a lot of heartfelt emotion.7 Billion Needles was Published by Vertical, but seems to be out of print, so you may need to buy some e-books in order to finish it all. ‹ Massage Parlor Murders Review: Who Knew 70’s New York Had So Many Massage Parlors? Tags: 2008, Horror, Nobuaki Tadano, Science Fiction, Vertical Inc.